This Ish is Hard: Post-it Session | Eat.Think.Design. 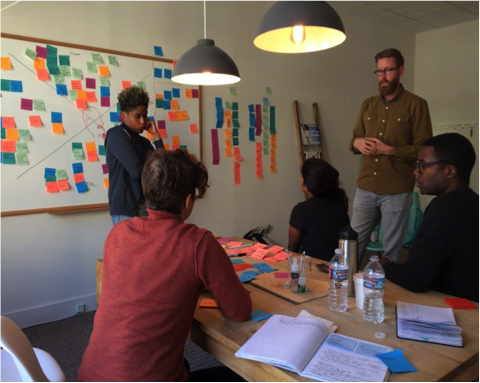 In Spring 2016, Shahidah Abdul Rashid, Victoria Benson, Sabine Dabady, and Victoria Benson worked with Youth Startup Lab to help provide youth from East Oakland with resources and training necessary to design their own food businesses through design thinking. Youth Startup Lab is collaboration between Civil Labs, East Oakland Youth Development Center, and Eat.Think.Design. We had gathered on a Sunday afternoon in one of those fancy, by-the-hour, straight out of The California Sunday Magazine office spaces in SF. It was quite a miracle to coordinate six different schedules to be in the same place at the same time. We were here for a design boot camp. Not a one of us UC Berkeley students knew what was in store for us, but we were hoping that the workshop would help us understand Civil Labs’ project better. At least from the perspective of its founders: Isaac and Graham. Graham presented us with the idea of doing an empathy map. 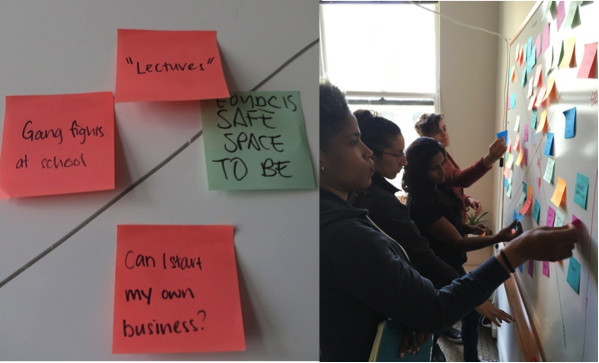 The exercise encouraged us to put ourselves in the shoes of our East Oakland Youth Development Center (EOYDC) youth partners by jotting down what we thought they saw, thought, felt, or heard on post-it notes (or post-its). One particular idea, scribbled on a post-it, was what stuck out to me and was worth exploring. Shahidah Abdul Rashid adding to the empathy map for the Civil Labs youth co-designers. The day before, Shahidah, one of our team members, had attended the Saturday session of Youth Startup Lab. Part of the session included a field trip to the monthly community market held in Castlemont, Oakland, a ten-minute drive from EOYDC. Both Shahidah and Isaac remarked that before leaving for the field trip, the time spent at EOYDC yielded a rich discussion on developing different aspects of a business plan. On the way to the market, the car bustled with energy. 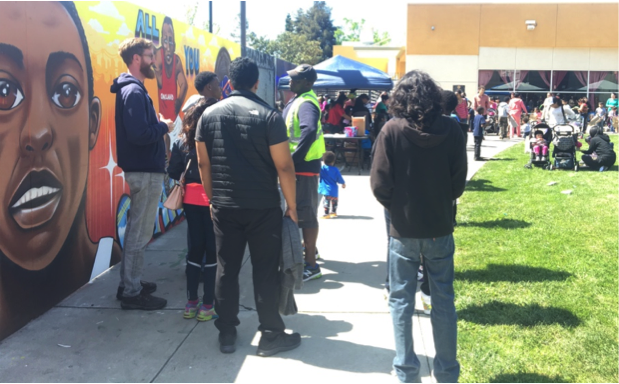 Our youth participants – all middle school students from East Oakland – were going to speak with some of the market-goers questions to practice interviewing potential customers. However, this was not what happened. Once at the market, the energy that could barely be contained in the car was gone. Hands jammed into pockets, shoulders curved inward, heads bowed, and barely a murmur stirred from the group when the Youth Uprising market tour guide asked them a question. Something happened the moment they entered a territory that was not their own. All this couldn’t have been because they didn’t have lunch… could it? Youth Startup Lab team at on a tour of the Castlemont Community Market in Oakland. At some point during the tour Shahidah overheard a conversation between two of the youth. Earlier that week, gang fights broke out at school. The fights were so big and disruptive that classes were shut down until order could be restored. This post-it noted a real threat – not a hypothetical one – to our youth partners. How did our youth partners feel with being in this new space of the community market? We paused. It was a long, heavy pause. This piece of information triggered something big. Someone got up and slowly moved towards the board and to start moving some post-its together. ETD team creating themes from empathy map. From left to right: Sabine Dabady, Victoria Benson, Shahidah Abdul Rashid, and Tara Benesch. “Gang fights at school,” “How can I start my own business”, and “EOYDC is a safe space to be” were bunched together. A Sunday afternoon meeting birthed an idea that was heavy, dense, immoveable. At least within the span of this course. 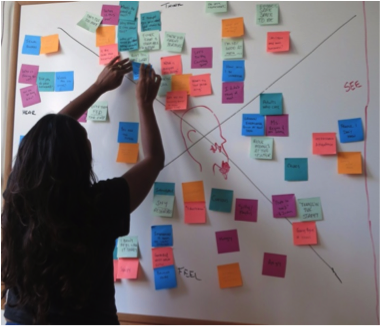 During the past 16 weeks of this experience of building design thinking tools, the post-it became more than just an artifact. It took our ideas, our questions, and our challenges and dared us to make them concrete. One post-it from one person could conjure something interesting. But really, the ultimate surprise of scribbling down an idea quickly, ripping off the paper from the stack, sticking it against a wall and doing that several more times – with several more people – is at the heart of powerful brainstorming. Sometimes that powerful brainstorming presents ideas so big that we became immobile. How do we proceed? How do we proceed? For more information visit civillabs.org.